The hard-drive specialist's first quarter was far from the blowout success that September's market tidings had outlined. 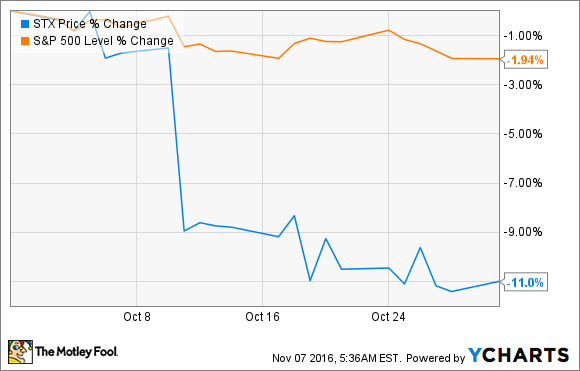 Shares of Seagate Technology (NASDAQ:STX) fell 11% in October 2016, according to data from S&P Global Market Intelligence. The hard-drive maker's sad trombone was voiced by a softer-than-expected first quarter, starting with a preliminary earnings report on October 11. You might recall Seagate rising 14% in September, based on positive signs for the global PC market and a $400 million direct investment in the company by activist investor firm ValueAct Capital. The September action set a high bar for Seagate's actual first-quarter results, and the company didn't exactly impress investors. Seagate likes to issue preliminary results a couple of weeks before each final earnings report, and this period was no different. This time, the early look raised management's revenue guidance from $2.7 billion to $2.8 billion. Gross margins were sketched out at 29% versus the existing expectation of "at least 27%." So things are getting better, but not quite as quickly as many investors had been hoping for. The day of the update Seagate shares plunged 7.6%. The complete first-quarter report was very much in line with the preliminary guidance, and did not move the stock at all. Following up on the earnings report, analysts raised their price targets but lamented Seagate's lack of strong financial guidance. Despite ValueAct Capital's $400 million buy-in, this was not a game-changing quarter in any way. So October's solid data undermined September's rosy reading of the tea leaves, and the whole two-month period was a wash.
Back to the lab again. Seagate still needs to figure out how to remain relevant in a storage market that's being flooded by solid-state drives at increasingly competitive price points. If ValueAct is taking the company in a new direction, investors haven't been told yet. Stay tuned -- and in my opinion, stay on the sidelines.